I can’t honestly say that there’s nothing better than cleaning scale insects off a lime tree right next to a window with a view of snow, but it does make for a nice contrast. Recently I discovered that the lime tree I’ve had for two years, this year spending the winter near a sunny window and therefore actually starting to make baby limes (after hand-pollinating on my part), had scale on a few of its branches. Scale insects spend most of their lives, after the youthful “crawler” stage, stuck in one place sucking out plant juices, and develop an exterior coating to protect themselves. Their presence is usually announced by the sticky honeydew they secrete, which will be found on the plant (or the floor) beneath their location. This photo shows both the brown bumps of scale and the shiny drops of honeydew. Searching Extension and other sources provides a range of solutions that don’t require potent chemicals. Had I gotten around to dealing with this problem a few days ago, I could have taken the tree (it’s a small tree as yet) outside and rinsed it with water to wash off the honeydew. It’s a little cold for that today! I may still put it in the shower, but for now simply wiping the leaves with a wet cloth gets rid of much of the stickiness. I dealt with the scale itself by scrubbing gently with an old toothbrush dipped in rubbing alcohol, and then cleaning the remains away with a paper towel. (Watch the thorns while doing this.) Insecticidal soap also works, as does plain water if you don’t mind using your fingernails a little. (Gently!) This can be a tedious task if the scale is extensive, but the infestation on my tree hadn’t spread very far. I’ll keep monitoring to be sure it doesn’t reappear. Some day later this winter when we have a warm spell (over 60 degrees and not windy) I’ll take the tree outside and spray it all over with horticultural oil, following package directions carefully. This will smother any remaining scale and prevent further attacks for a while. I’ll do it again when I take the tree outside for the summer. I use the same general approach for my orchids, once they are inside for the winter. 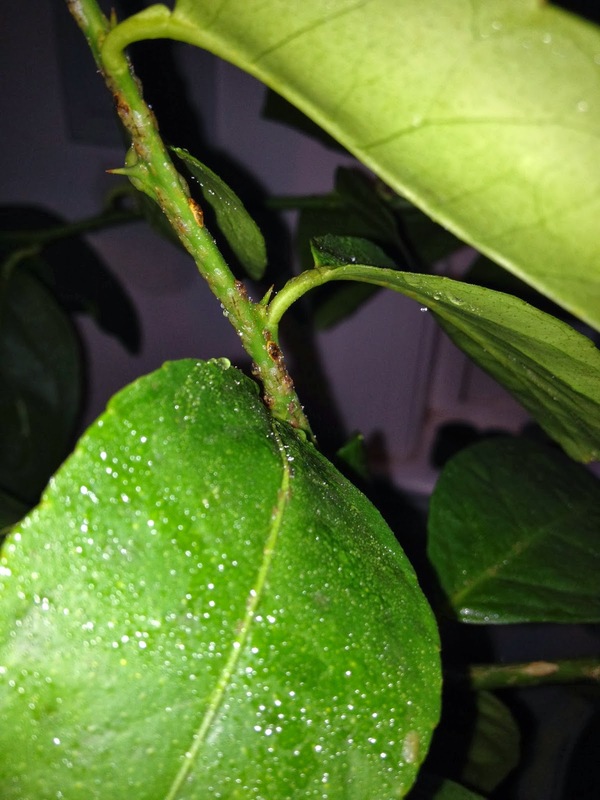 Prior to bringing them in, I spray them twice with either horticultural oil or insecticidal soap, depending on whether I see scale, mealy bugs or aphids. Rats! I haven't cleared all of mine yet, but I'm trying a once-a-week cleaning approach – missed the warm-weather spraying opportunity again, though.